The cave-city of Vardzia in southern Georgia is surely one of the wonders of the medieval world, a burst of imperial exuberance. Georgians built this extraordinary place, conceived as both monastery and citadel, in the 12th and 13th centuries, at the height of their country’s power. An immense network of tunnels, residences, churches, barns, wine cellars, stables and libraries was hewn from the living rock. The Persian chronicler Hasan Bey Rumlu described Vardzia as a “wonder”, “impregnable as the wall of Alexander the Great”. A four-hour journey by marshrutka took me from Tbilisi first to the leafy town of Borjomi, famous for its mineral water, then on to Akhaltsikhe, a pretty place dominated by a medieval castle. The road followed the upper reaches of the Mtkvari, the river on which Tbilisi stands. The surrounding hills on the approach to Vardzia are rocky and arid, but the valley is green and alluring, popular with picnickers. This entire region, called Samtskhe-Javakheti, is dotted with fortresses and churches. But the jewel in the crown is Vardzia. not far from the Turkish border. A couple of kilometres from the ruined city I found myself a farm bed and breakfast, next door to a nunnery. It was the rural idyll, Georgia style – a few cows, some hens, 13 beehives, apple trees, walnuts, maize and sunflower. As I breakfasted outdoors, a brood of chicks headed off with mum in the direction of the walnut grove. 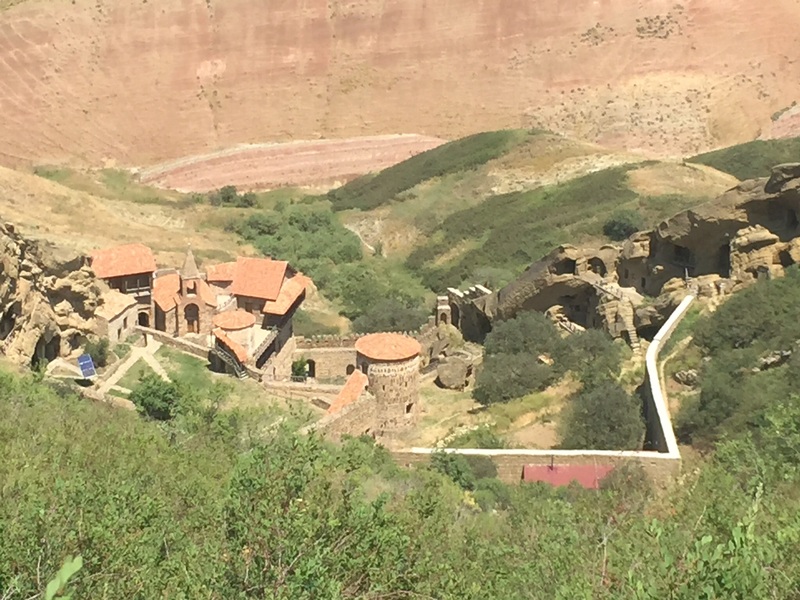 The Vardzia site, close to the fast-flowing Mtkvari river, opens at 10 a.m. and I was there on the dot. In the heat of a Georgian summer you don’t want to scramble over a rock face under the midday sun. The caves stretch along the cliff for about 500 metres, up to 13 tiers deep. Even today, with the help of hand-rails and wooden steps, it benefits the visitor if she has a few wild goat genes in her DNA. Some of the time I found myself shinning up or down tunnels and then emerging to admire the view from a totally different vantage point. Vardzia was designed to be self-sufficient in the event of siege and that meant a lot of work. According to my audio guide, a five-kilometre tunnel was cut into the cliff wall, about seven metres above the ground, to convey water from springs. The tunnel had enough headroom for residents to be able to check that there were no problems with the ceramic piping. The water supply could provide up to 207,360 litres per day, enough for up to 7,900 people. The construction of this mind-boggling structure coincided with a period of expansion and self-confidence, Georgia’s Golden Age. Building began during the reign of Giorgi III (1156-1184), who clearly graduated from the School for Strong Medieval Kingship. Giorgi faced a rebellion by nobles who wanted to put his nephew on the throne. He suppressed the revolt and ordered his nephew to be blinded and castrated. Work at Vardzia continued during the reign of Giorgi’s daughter Queen Tamar (1184-1213), the most revered monarch in the country’s history. During her reign Georgia grew to the peak of its power, holding sway over lands from modern-day eastern Turkey, through the south Caucasus and into western Persia. Vardzia became a spiritual, economic and political centre, with 420 store rooms and wine cellars and 15 churches. A chronicler describes how Queen Tamar addressed her troops from the balcony of Vardzia’s main place of worship, the church of Holy Dormition, before the battle of Basian against the Seljuk Turks. This battle, fought around 1203 in what is now northeast Turkey, was a victory for the Georgians. 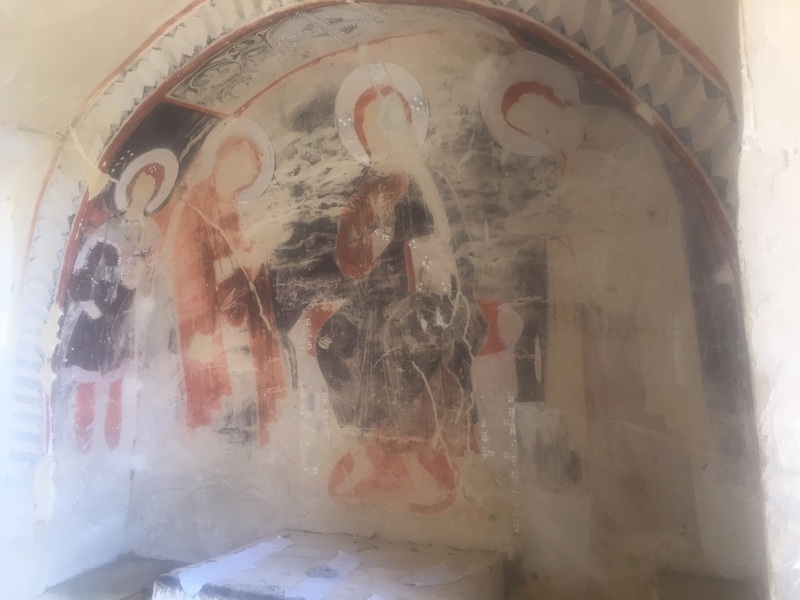 The Dormition church contains a famous wall painting of Queen Tamar, an iconic piece of medieval Georgian art. In 1283, an earthquake seriously weakened Vardzia as a citadel. But it lived on until Persian troops captured it in 1551, after fighting in the caves themselves. 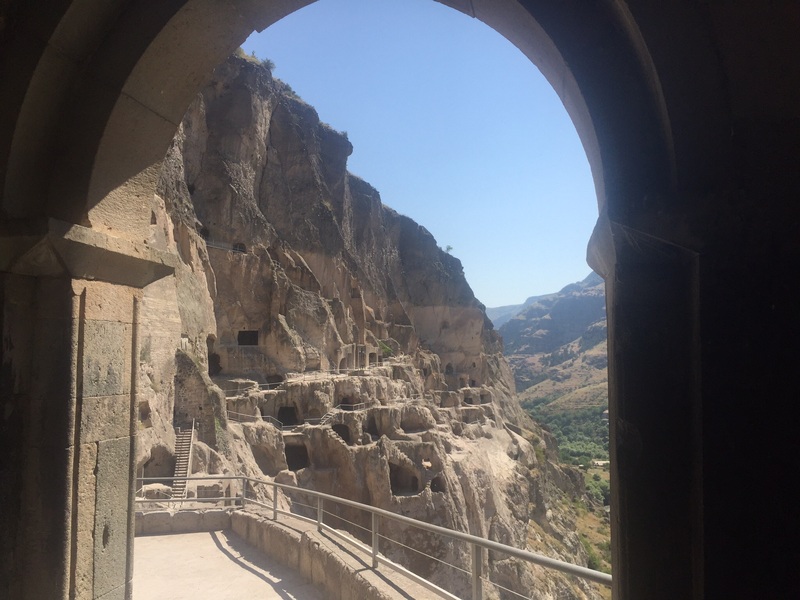 Today five monks live at Vardzia, sharing the cliff with thousands of birds such as martins and swifts who help to bestow on this exquisite place a sense of peaceful sanctuary. 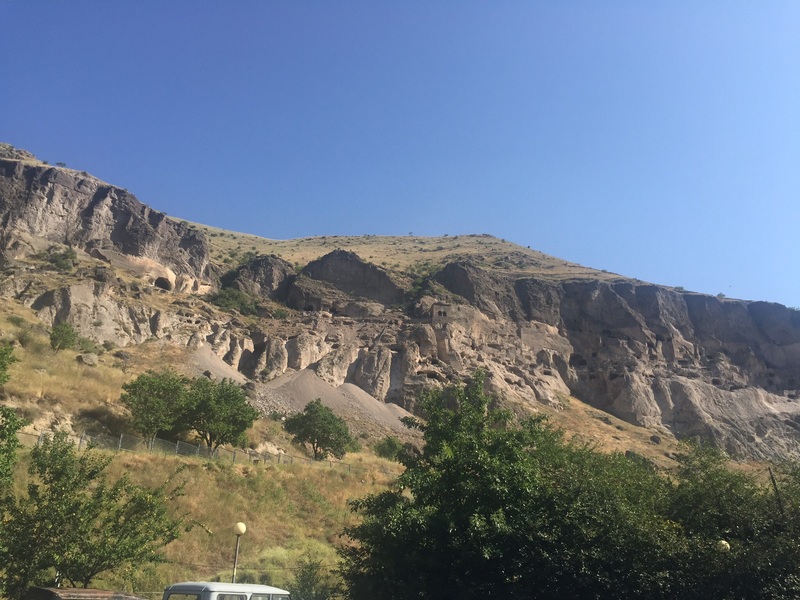 Back in June, I visited another rock-hewn monastic complex on the edge of the Christian world, David Gareji, in the southeast of the country on the border with Azerbaijan. It was founded in the sixth century by David Gareji, one of 13 Assyrian holy men who arrived to spread Christianity. 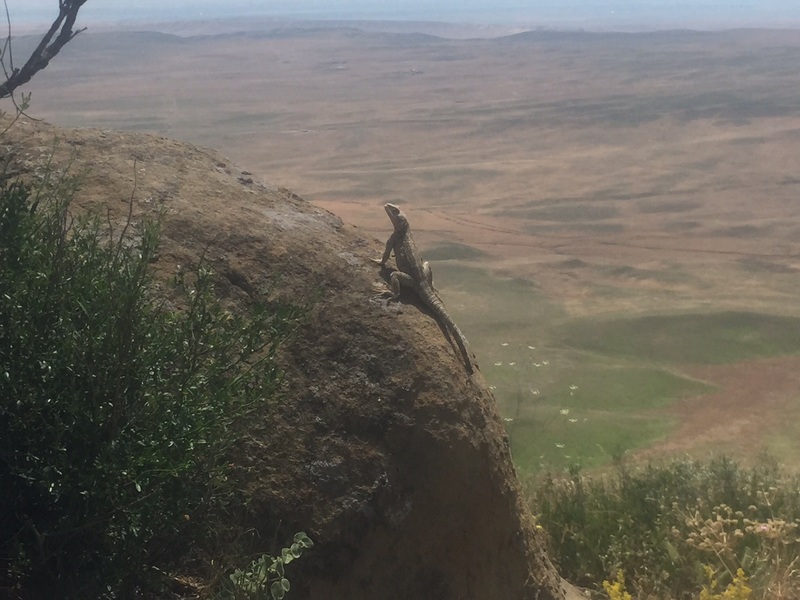 Like Vardzia, David Gareji is an enchanting place with exuberant wildlife, including Egyptian vultures. The day I arrived it was alive with dancing butterflies, flowers and lizards. The guide books say to be careful of poisonous vipers, but I didn’t spot any. 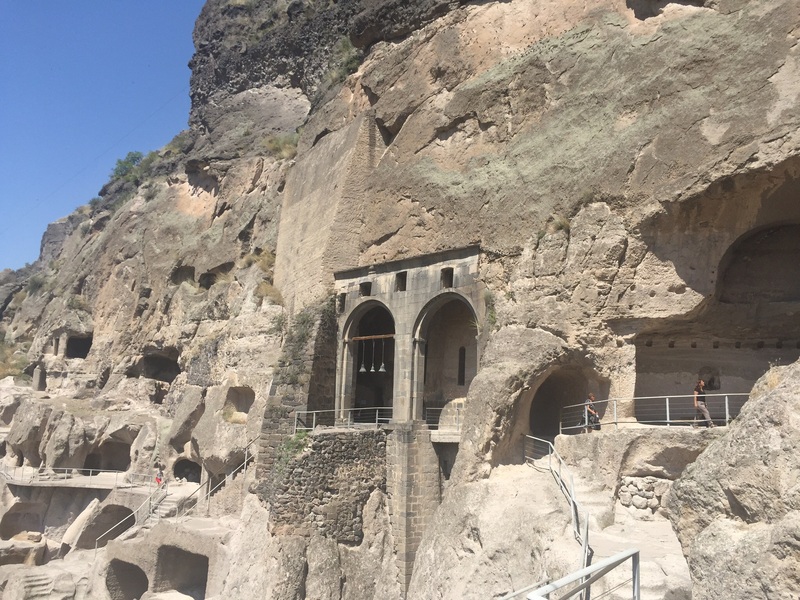 Again like Vardzia, David Gareji’s heyday was during the Golden Age of Georgia and it grew into an important religious and cultural centre with hundreds of caves, serving as monastic cells, churches and refectories. David Gareji was the scene of a terrible massacre in 1615, when on Easter night Persian soldiers led by Shah Abbas killed 6000 monks and destroyed artistic treasures. The monasteries never fully recovered and they closed after the Bolshevik conquest of Georgia in 1921. In the late 20th century the Soviet Union used David Gareji as a firing range, training its forces as it fought a war in Afghanistan. Georgian protests against this Soviet desecration of a holy site were part of a swelling nationalist movement which led to Georgia’s recovery of independence in 1991. When the Georgian army returned to the bad old ways of Soviet times in the late 1990s activists camped out on the site and put a stop to the military exercises. Four hundred years after the slaughter of the monks, this region feels quite empty of human beings. The landscape is lunar, green in the early summer but still with a feeling of the desert. Today at David Gareji monastic life has revived on a minor key – there is one working monastery, Lavra, with 10 monks. This picture postcard monastery has both solar panels and monastic cells cut from the rock. From Lavra, I walked up onto the ridge and took in the great sweeping views of the Azerbaijani plains below. A footpath leads down on the other side to the caves of the Udabno monastery, with frescos from the Middle Ages. There is a low-level border dispute between Georgia and Azerbaijan over the David Gareji site. Ideally, Georgia would like the monasteries on the Azerabaijani side of the ridge to be brought back into its national territory. Walking along the narrow path to regain the ridge after visiting the caves I nearly bumped into two well-armed Azerbaijani border guards. We exchanged warm greetings and I walked on back into Georgia.